On June 29, 1955, R. Gordon Wasson, then a vice president of the prestigious banking firm J.P. Morgan, together with his friend, New York fashion photographer Allan Richardson, made history by becoming the first whites to participate in a velada. The nocturnal mushroom ceremony took place in the remote village of Huautla de Jimenez, in the northeast region of Oaxaca, Mexico. Under the guidance of the now famous Mazatec curandera Maria Sabina, Wasson and Richardson each consumed six pairs of the mushroom Psilocybe caerulescens var. mazatecorum. After an hour the two men began to feel the effects, which were manifest by visions of colorful geometric patterns, palaces, and architectural vistas. Above: Life, May 13 1957. Courtesy The Stain Blue Museum Collection. 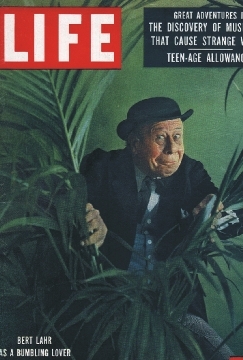 Life magazine, as part of its "Great Adventures Series," published in its May 13th 1957 issue (the one with actor Bert Lahr on the cover) an account of this event titled, "Seeking the Magic Mushroom." This article, which inspired Dr. Timothy Leary and countless others to try the mushrooms, is considered by many to be the instrument that ushered in the "Psychedelic Revolution" of the 1960s. Huautla de Jimenez, August 1996. This remote village is nestled in the Sierra Madre Oriental at an elevation above one mile. The region is also home to Sistema Huautla, the deepest cave in the Western Hemisphere. Photo courtesy The Stain Blue Museum Collection. Huautla de Jimenez would later become inundated with hippies hoping to "trip" with Maria Sabina. John Lennon, Peter Townshend, Mick Jagger, and Bob Dylan are some of the celebrities who traveled to Huautla, seeking the spiritual guidance of Maria Sabina. Although the Life article made Maria famous, it also brought her great suffering. 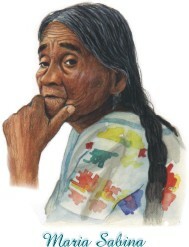 Sadly, her home would later be burned and she was banished to the outskirts of town as punishment for divulging the Indians' age-old secret about their use of teonanacatl, or "God's Flesh." She never regretted having met Wasson, however, and felt that it was destiny. She passed away on November 22nd 1985, and is now a legend in Mexico. First collected in 1923 by W.A. Murrill, on sugar cane bagasse near Montgomery, Alabama, this mushroom has never been reported from the U.S. since. In Mexico this entheogenic Psilocybe is common in the states of Veracruz, Puebla, and Oaxaca, where it can be found fruiting in clusters from bagasse and also from geologically disturbed areas (its common name is "The Landslide Mushroom") throughout spring and summer. 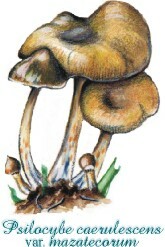 Several varieties of this species exist: Psilocybe mazatecorum; P. caerulescens var. mazatecorum f. heliophila; P. caerulescens var. nigripes (known to the Indians as "Mushroom of Superior Reason"); and P. caerulescens subsp. caerulescens var. albida. The mazatecorum variety was named in honor of Maria Sabina and her people by the esteemed French mycologist Roger Heim. 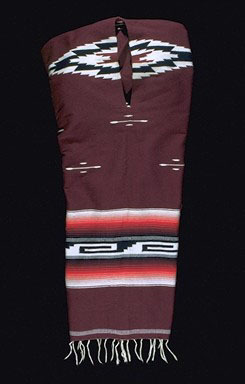 Above: Mazatec serape acquired in Huautla de Jimenez. 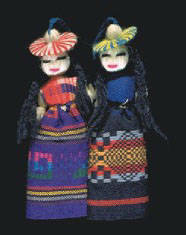 Below: Mazatec dolls acquired in Huautla de Jimenez. The Mazatecs are world renowned for their brightly colored, hand-woven fabrics. Wasson, R.G. "Seeking the magic mushroom." Life 42(19): 100 (1957). Wasson, R.G. "The hallucinogenic fungi of Mexico: An inquiry into the origins of the religious idea among primitive peoples." Botanical Museum Leaflets Harvard University 19(7): 137-162 (1961). Wasson, R.G. "The hallucinogenic mushrooms of Mexico and psilocybin: A bibliography." Botanical Museum Leaflets Harvard University 20(2): 25-73 (1962). Wasson, R.G. et al. Maria Sabina and Her Mazatec Mushroom Velada. Ethnomycological Studies No. 3. Harcourt Brace Jovanovich, New York (1974).